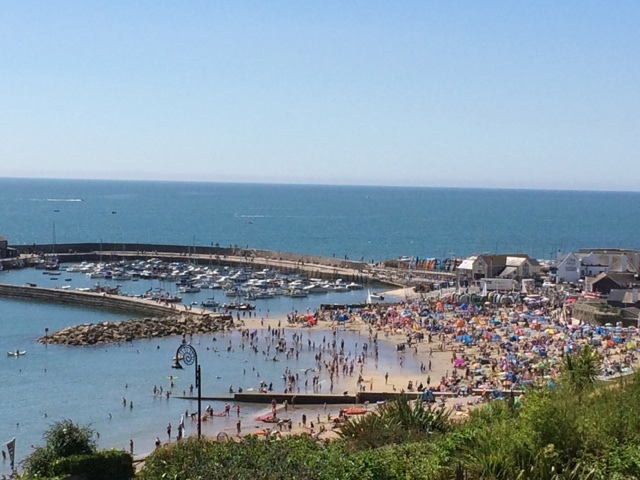 It was a glorious day in Lyme Regis yesterday. Peter went out fishing on his friends boat, while us wives wandered around the town and sea front. As the boat came in, we walked across the beach to the harbour wall, past families and sun bathers to discuss (take the piss) out of the day's catch. Our time spent on the actual beach was less than 10 minutes, but it was the most stressful 10 minutes I've had in ages. Territories were clearly marked, battle lines were drawn, kids were in meltdown, ice creams had been dropped, mums were pinning kids down rubbing sun cream onto sandy skin, prams were being dragged, mums and dads were snarling at one another as they attempted to shield their lunch from seagulls, set up windbreakers and inflate beach balls. Holidays have always been a nightmare for me, with 5 kids, one of whom is disabled and likes to eat sand and rub it in her eyes, only 2 adults and with 5 kids to supervise, a crowded beach filled me with dread, we've had lifeguards rescue kids from the sea in France and the coast guard out looking for the youngest on Perranporth beach whilst being filmed by BBC Seaside rescue, apparently I didn't show enough emotion over the 2 hour period for them to use any footage. Wow thats full of people! Really busy! The view and angle of your photo is stunning! Really wouldnt want to bring a child out there as I can foresee a meltdown cuz it crowded.